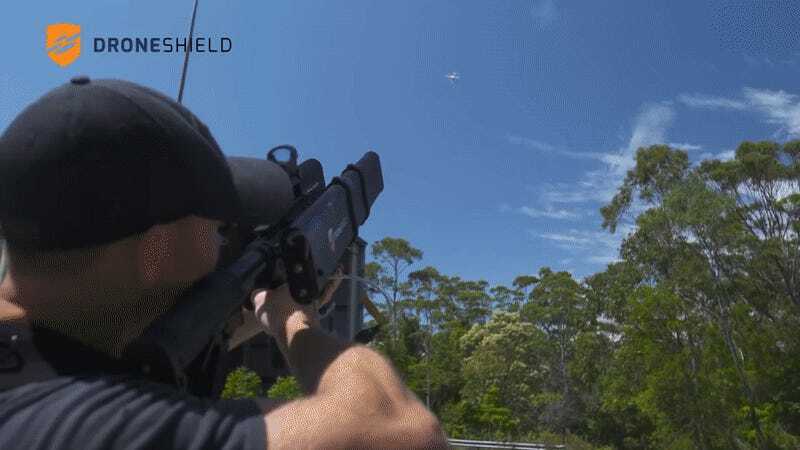 NASCAR has hired DroneShield, a company that sells devices that look like oversized cosplay weapons but which actually remotely disable UAVs, to protect its sporting events. Per TechCrunch, NASCAR has contracted with the company for races held at the Texas Motor Speedway in Fort Worth, which hosts many of the racing league’s events like the 2018 Monster Energy NASCAR Cup Series. DroneShield deployment is ostensibly intended to prevent pilots from endangering audience members or drivers. That’s a legitimate concern, given that the growth of the drone hobby has also been associated with an increase in people flying them where they shouldn’t, and that the last thing anyone needs is a drone plummeting into a pack of cars going 200 miles per hour. But one might also speculate that sporting leagues like NASCAR have an interest in keeping live event streams safely kept behind paywalls, like TV channels that pay them billions of dollars for broadcast rights. According to a company press release, the system has three distinct components: DroneSentinel, a static array of sensors that detects incoming drones; DroneSentry, which is similar but incorporates countermeasures; and DroneGun, the portable version that looks like a sci-fi rifle. Company CEO Oleg Vornik told TechCrunch in a statement that as far as he’s aware, it is the first “live operational use” by police of all three components of the system in the US. As seen in the video below, the latter two work by bombarding the drone with powerful signals that interfere with its ability to communicate with its controller. Many drones respond to loss of operator control by trying to return to a safe location or simply making the nearest landing, though cheaper drones may simply fall out of the sky. The technique only works if the device is constantly aimed at the offending UAV, or else its original pilot may be able to reconnect and regain control. DroneShield use is currently limited to the military or authorized law enforcement agents. Specifically, that means federal law enforcement, since Federal Communications Commission regulations prohibit anyone else including state and local police agencies from using technology to jam cellular, radio, or Wi-Fi signals. (This doesn’t apply to the UAV detection tools in some of the DroneShield devices, just the countermeasure abilities.) In a prior statement to TechCrunch, Vornik said he didn’t expect there to be any exemption for DroneShield equipment. Since DroneShield named a number of local law enforcement agencies as utilizing the three devices in their press release, it’s not clear whether only federal law enforcement on-scene at the speedway was cleared to use the countermeasure abilities, or if state and local police got authorization to do so under some kind of supervisory arrangement with the feds. Gizmodo has reached out to DroneShield for comment, and we’ll update this post if we hear back. In any case, operating a personal drone at any high-profile situation where airspace is restricted is a sure way to attract unwanted attention. Last year, the Center for the Study of the Drone at Bard College released a study on 30 drone-related incidents “that resulted in some form of legal or disciplinary action by a local authority,” as well as a handful that resulted in enforcement actions by the National Park Service and Department of Justice.